These Trees grow to a middling Height and Size, having a rough brown Bark. Their Leaves are of an oblong Oval Form, with a Notch at their Ends. The Flowers seemed to be monopetalous, but as I had not an Opportunity of seeing them in Blossom, I am necessitated to refer to this Plate, which shews at Fig. I. the Fragments of the decayed Flowers, and Fig. 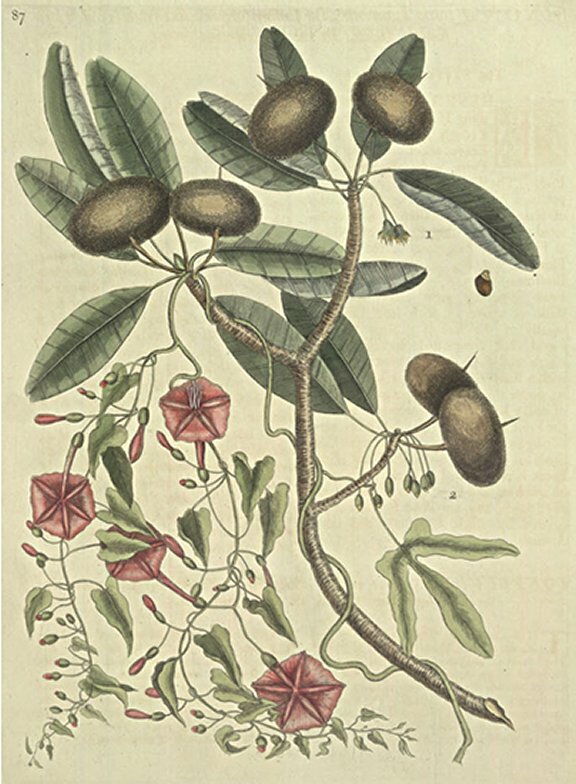 2. the Buds of the Blossoms hanging pendant; tho' the Fruit generally grow erect to Foot stalks of above an Inch long, and are usually of the Size of a large Walnut, round, but compressed, having a very rough russet Coat of a brown Colour, with a sharp brittle Spine growing out of it; under this Coat is a spongy Pulp, full of milky juice of a pleasant Sweetness when the Fruit is perfectly ripe; but if not, very astringent and disagreeable. Several hard Seeds are contain'd within the Fruit, of the Form here exhibited. These Trees grow on Andros, and some other of the Bahama Islands, and are Food for, and much coveted by Birds, Guana's and other Animals. This Convolvulus climbs upon Trees and Shrubs in dark Thickets and shady Woods. The Leaves are sharp-pointed, in Form not unlike the Head of an Arrow or Javelin, except some Leaves towards the Root, were trifoliate and remarkably different from the rest. The Flower is tubulous, with an open pentagonal Cup, and of a purple red Colour. This with the Anona I found joined in the Manner here exhibited.